It's Christmas Eve, 1975. Do you know where your 45 of "Bohemian Rhapsody" is? It seemed not too long ago that Queen had just a couple of live albums. Plenty more have popped up over the years since frontman Freddie Mercury's passing, ones that conveniently give listeners glimpses of the Queen eras not documented on Live Killers and Live at Wembley '86. A new one has just been added to their canon, one that is trumpeted so proudly that it's a slight wonder that it hasn't been properly released before. 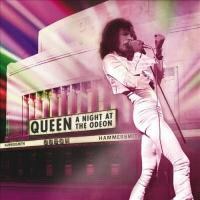 It's a live broadcast of Queen playing a full set on Christmas Eve, 1975 at London's legendary Hammersmith Odeon. Cheekily titled A Night at the Odeon, their landmark album A Night at the Opera was released a month prior to the show, this album captures the mighty glam-pop band playing to a packed house and a cluster of BBC cameras beaming their show into living rooms across the United Kingdom as its citizens hung their stockings with care. It must have come as a shock to some. When you combine the progressive musical leanings of the band's early sound with their taste for flamboyant theatrics while factoring in the fact that Queen could rock like crazy, the end concoction could have been terrifying to someone hoping for a relaxing evening in front of the television. Never having a chance to see Queen live, I tried to pester a friend of mine into telling me her experience of getting dragged by her older sister to see them some time in the late '70s. The most I can get out of her is "I just remember I was scared." Queen's reputation of being a barnstorming live act and Freddie Mercury's reputation of being a frontman to end all frontmen is succinctly captured on A Night at the Odeon, even if you're only going for the audio package (the show is available on DVD and bluRay). The crowd roars when the band is introduced. Brian May chugs out the eight-note D chord to "Now I'm Here". Mercury's echoed introduction draws another surge of noise from the crowd. Then the rhythm section that Rolling Stone magazine once described as "explosive" and "a colossal sonic volcano whose eruption makes the earth tremble" makes its entrance. At this point, the band is off and running like it was a day at the races. Roger Taylor and John Deacon pound on their instruments as if they would have no trouble doing so all night. May's Red Special ceases to be a violin and behaves more like a bulldozer when he takes the stage. Mercury, as usual, sings like he has an endless supply of energy. Combined, Queen have the audience in their collective palm. Even though A Night at the Opera was already a hit album at the time while its runaway lead single "Bohemian Rhapsody" (a song turning the ripe age of 40 as of this writing) was climbing the charts at an alarming rate, the set Queen performs here leans heavily on their first three albums -- Queen, Queen II, and Sheer Heart Attack. "Bohemian Rhapsody" does manage to make it into the set, but not the entire song. Queen uses it to start their traditional early-in-the-show medley, using the piano ostinato just prior to the operatic section as a segue into the hit single "Killer Queen". After a protracted version of "The March of the Black Queen", the band sneaks back into the half-tempo coda of "Rhapsody" with the "ooh-yeahs". After Taylor strikes the gong, Mercury stays at the piano for a mostly instrumental blast through the ragtime number "Bring Back That Leroy Brown". The only other cut from Opera is May's arrangement of "God Save the Queen", played over the house speakers as the band takes their final bow. More time is given to "Brighton Rock" and its extended guitar solo, showing off May's ability to harmonize with himself over a series of echoes. You could also say that the eight-minute version of "Liar" vies for far more attention than Queen's latest album at the time. I suppose Queen weren't really selling the album, the album was selling itself. Queen, in turn, were selling themselves. If that meant sneaking in the stimulating prog attack of "Ogre Battle" as the night's second song, then so be it. In usual Queen manner, their covers are treated as curious toss-offs and little more. The first time the band returns to the stage, Taylor announces that they're about to play "some rock and roll". This translates to the old swingin' number "Big Spender" and a medley that includes "Jailhouse Rock" and "Shake, Rattle and Roll". Then that's it for the covers. Their second encore starts with the early single "Seven Seas of Rhye" and May's slow-grinding faux-blues number "See What a Fool I've Been". The cameras were allegedly switched off by this point, so video footage of this second encore doesn't exist. But every moment of A Night at the Odeon's audio boasts a big, crystal-clear sound that more than makes up for any lack of visuals that might rankle the collector. It really does sound like it was all captured just last night. There has been speculation on whether Queen were jesting their way through their career or if their appreciation for kitsch was reaching some profound new levels. Melody Maker's Hammersmith Odeon show announcement of "Britain's most regal band awaits your presence..." certainly has a hammy ring all its own, as if the writing staff were gleefully awaiting for the band to fall flat on its face that night. But I wasn't there. One thing that is clear is that Queen were serious about their shows. True, A Night at the Opera once held the distinction of the most expensive album ever recorded due to the band's meticulous approach to perfection. At the same time, they wanted to make sure that the people sitting in the back of the balcony always got their money's worth. So, use this year's holiday season as an opportunity to turn the clock back to a simpler time. You know, a time when a six-minute mash-up of opera and rock could reach number one in the charts.